Braves pick up win in non-conference game. HOUSTON, TX. – Braves wide receiver Norlando Veals recorded a season-high 140 yards on six catches including a 45-yard touchdown to get Alcorn State its first score of the night as the Braves picked up a road victory in what was considered a non-conference game. Alcorn State (3-2, 1-0 SWAC) took a 14-0 advantage after a P.J. Simmons eight-yard touchdown run capitalized by a C.J. McCullough extra point with 35 seconds remaining in the first quarter. Texas Southern (0-4, 0-1 SWAC) did answer immediately as Daequan Jones returned the kickoff 93 yards for a touchdown. The score remained a 14-7 Braves lead until halftime before the teams traded rushing touchdowns and field goals in the second half. 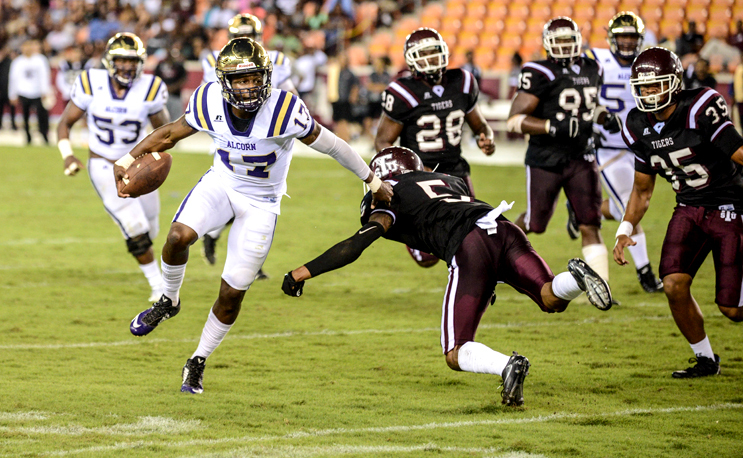 Alcorn State quarterback Lenorris Footman completed 14-of-25 passes for 241 yards with one touchdown while the SWAC’s leading rusher De’Lance Turner added 115 yards on the ground in the run attack. Isiah Thomas led the Braves defense with a team-leading 13 tackles including three for a loss and an interception. Darvin Kidsy led the Tigers with 11 receptions for 87 yards.